It should have been one of the happiest days of Porsha Jenkins’ life. The 27-year-old mother of two reported to NorthBay Medical Center for a Caesarean section, her third “birth by appointment.” And for once, all the planets seemed aligned, according to her husband, Elvin. There was little traffic on the freeway, Porsha’s mother, mother-in-law and grandmothers all arrived on time. And the procedure went off without a hitch, with the birth of 6-pound, 13-ounce Corrie-Ray Jenkins, at 1:04 p.m. on Jan. 11, 2013. Then it all went sideways, when a life-threatening complication occurred. She remembers very little about the next two weeks, other than being rolled back into the operating room. What no one knew at the time was that Porsha had some severe scar tissue on her bowel from a previous surgery. It’s uncertain what prompted the scar tissue to break loose, but one thing is certain: she began bleeding profusely. Leigh Fannin, R.N., Porsha’s labor and delivery nurse, took only a second to react, calling a “Code Blue”—hospital-speak for life-or-death emergency. Within minutes, Porsha’s room was filled with physicians and nurses from across the hospital. Dr. Camile Barnes, Porsha’s obstetrician, had already left following the delivery, but came back as soon as she was paged. Hospitalists and anesthesiologists responded, as did Women’s and Children’s Services Director Deborah Thorson, R.N., and Daman Mott, R.N., director of Emergency and Trauma Services. Heather Venezio, R.N., Trauma Program director, came up from the ED to start the IV on the young woman whose veins were collapsing. Lori Gould, R.N., brought a rapid blood infuser from the post-anesthesia care unit, while Labor and Delivery nurses Michelle Harris, R.N., and Wislise Zamor, R.N., assisted Fannin. Pharmacist Dan Ford came to help the anesthesiologists and physicians avoid potential drug interactions. The team began to implement NorthBay’s Massive Transfusion Protocol, but Porsha was losing blood as fast as it was going in. 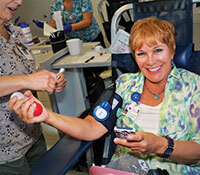 In the end, she required more than 40 units of blood—four times her body’s volume. A former military nurse, Mott could tell more needed to be done, so he made a split-second decision to call a “Code Trauma” to summon another set of doctors and nurses. He has seen his share of traumatic casualties and knew Porsha was in grave condition. Mott contacted David Grant Medical Center at Travis Air Force Base as well as local blood banks to ensure a constant supply would be available. NorthBay Blood Bank Director Rowena Vince Cruz coordinated efforts to keep the blood coming, and Thorson and Women’s and Children’s Services Manager Katie Lydon, R.N., literally ran downstairs to the lab and back to the second floor numerous times to deliver blood. 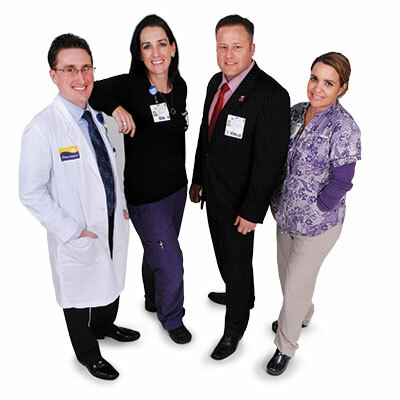 According to Dr. Zopfi, the key to the calmness is communication, organization and teamwork. “The beauty of a trauma program is to have a plan to bring resources together and put systems in place,” Dr. Zopfi said. During the next four hours, the source of the bleeding was discovered and repaired, and a hysterectomy and temporary colostomy were performed. Porsha was finally stable. A second surgery was completed the next morning. By the time Porsha woke up, she was in the ICU asking about her baby. Two weeks later, she returned to her Dixon home, where she and Corrie-Ray are surrounded by their loving family, including his big brother Japre, 7, and big sister Uriah, 3. Traumas can happen anywhere, even in the hospital. And often, trauma patients are our friends and neighbors, not strangers. Porsha is living proof of that and her experience has convinced her to follow her dream to become a nurse. She knows she has much to give back. “I think about the what-ifs—what if it had been an uneventful surgery and I was in my room holding my baby? But it wasn’t and the NorthBay nurses and doctors were wonderful. They revived me and kept me alive. Among the many team members to pitch in once a Code Trauma was called were Pharmacy Clinical Coordinator Dan Ford; Trauma Program Director Heather Venezio, R.N. ; Trauma and Emergency Services Director Daman Mott, R.N. ; and Recovery Room clinical nurse Lori Gould. Susan Gornall, director of Perioperative Services, is all smiles as she donates blood to BloodSource at NorthBay Medical Center in April. More than 100 NorthBay Healthcare employees, family and friends—as well as friends and family of Porsha Jenkins—turned out to replenish the supply. Porsha needed 40 units of blood during her crisis, nearly four times her body’s volume. This story moved me to tears, I don’t even know how to start. 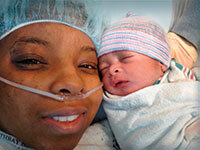 I’m happy for Porsha and also happy the NorthBay Medical Center team delivers. Life is a gift. A big Thank You to all the nurses and doctors. Dr. Zopfi — God bless you. Me and my wife just had our first child at NorthBay on Sunday, Aug. 11. I must say, the guys at Labor and Delivery are beyond wonderful; our stay was excellent. Thank You.